The most commonly heard comment from visitors traveling in Honduras is that they are surprised…Honduras wasn’t what they expected; it was far, far more. Honduran tourism is quite diverse–it has a unique culture and archaeological history to explore and it boasts a wide variety of natural attractions within easy access for travelers. You can visit the ruined Mayan city of Copán, which is a primary tourism attraction in Honduras, and later that same day, enjoy a jungle canopy tour or try your hand at white-water rafting. The next day, head for the coast and enjoy some amazing beaches and diving on the second-largest barrier reef in the world. Honduras is also bordered by Guatemala, El Salvador, and Nicaragua, all of which can be easily accessed by Honduras’ road system. 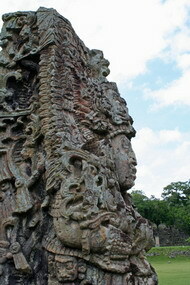 Copán Ruinas is a magnificent park of Mayan ruins and a major source of information regarding the Mayan civilization. It is located near to the border of Guatemala and is therefore popular with people traveling in Honduras and other parts of Central America. UNESCO declared Copán Ruinas a heritage of humanity site in 1980. Focus on the city by archaeologists for over a century makes it the most studied city of the Maya. When there, be sure to explore the Ball Court, the Great Plaza, the Acropolis, the tunnels, and its famous Hieroglyphic Stairway. A comfortable 90-minute ferry ride, or a 15-minute flight away from the mainland lay the gorgeous Bay Islands. These islands offer a variety of choices for those traveling in Honduras and seeking the island life. Destinations include the tiny and private Cayos Cochinos, which offer unspoiled virgin diving of the highest caliber, Utila with its quaint and quirky architecture and miles of pristine white sand, and Guanaja with deep-water sea mounts to dive upon and lush vegetation. 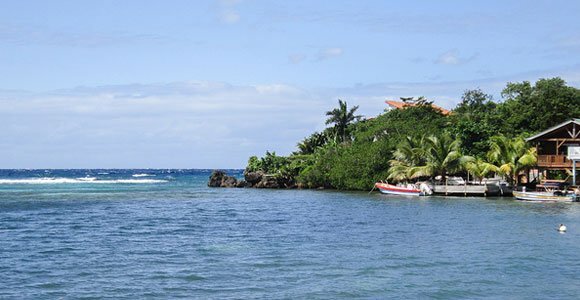 Most Honduran tourism is focused on the island of Roatán, where you will find anything from a private 3,500-square-foot villa with its own pool, boat, and car for rent, to cottages in cheap and cheerful West End, where you can enjoy great diving, fishing, restaurants, happy hours, and souvenir shopping. Roatán is the home of several canopy tour operators, as well as the Roatán Institute for Marine Sciences’ Dolphin Communication Project, where travelers can learn about, and swim or dive, with these lovely creatures. The island’s 18-hole championship golf course, The Black Pearl, was designed by legendary Pete Dye and brings in elite competitors from around the world to play on this stunning course at Pristine Bay. Roatán’s Juan Manuel Galvez International Airport allows North Americans to access the island directly via a short 2.5-hour flight from Houston or Miami almost daily. Other international flights arrive directly from Atlanta, Dallas, Montreal, and Toronto throughout the year. All of the Bay Islands are known for their superb scuba diving and for the fact that they are historically English-speaking islands, and therefore are tourist-friendly to the North American traveler. Tela, formerly a sleepy coastal town, is slowly but surely becoming an important beach-tourism destination on the north coast of Honduras. It is less than 90 kilometers east of San Pedro Sula’s international airport and connected by an excellent paved highway to the large city. Surrounded by national parks and hosting one of the world’s largest Garifuna communities, Tela offers not only pristine beaches but also an incredible array of cultural and natural wonders. The tiny city of La Ceiba on the north coast has much to offer youthful travelers, who are beginning to catch on to its many advantages. Bordered by the Pico Bonito National Park, it offers the amazing experience of the Cangrejal River cascading down through cloud forest to the white sandy beaches of the Caribbean Sea. Several different types of adventure sports are available here for the more daring people traveling in Honduras, including white-water rafting, canopy zip-line tours, and hiking. Lovely accommodation is available in hotels up in the mountains and on the river for a sporting or a meditative spa experience. Tourists with more energy can visit the Zona Viva on the beach at La Ceiba, which has a multitude of excellent and inexpensive eating places and nightlife for those travelers who are young or young at heart. Just east of Trujillo (which is worth a visit in its own right, being Honduras’ most historic Spanish colonial city and the location of many exciting battles where the Spanish defended their flotillas from European and pirate threats) is the area of La Moskitia, or the Mosquito Coast. It is sparsely populated, inaccessible by land, and home to the largest tract of virgin tropical rainforest in the North American hemisphere. A good part of this area is protected by law as one of five distinct Honduran nature reserves. Its name comes from one of its several indigenous groups, the Miskitos. Honduras is in fact the home to a multitude of different cultural groups and living cultures, all existing in harmony. In addition to the Miskito Indians and many other Indio groups, there are the Garifuna people, descended from African slaves and settled in large groups in Trujillo and on Roatan, and several smaller settlements elsewhere in Honduras. The Garifuna people retain their colorful culture, which includes the music known as Punta, and the dances that accompany it. They are a gentle people who live close to nature, and who are most pleased to share their culture with visitors traveling in Honduras. You can find them in their own villages where you will be warmly welcomed to an unforgettable tourism experience, or also in a few visitor centers such as Yubu near Punta Gorda on Roatan Island. San Pedro Sula is the second-largest city in Honduras. It is a large industrial center and the home to several North American companies. Tegucigalpa, a city of almost a million people centered around its cathedral, satisfies the cultural needs of its multicultural society with symphony, country clubs, and universities. Villa Elena is one of its lovely country clubs, located on the hills over the city on 700 acres. It currently has 50 homes built around its golf course. Less than 30 minutes outside of Tegucigalpa you can find several artisan communities, such as the town of Danli known for its cigars, Ojojona for ceramics, as well as Santa Lucia and Valle de Angeles–each one worth a visit during your Honduran travels. Citizens of the following countries require only a valid passport to enter Honduras: all Central American countries, Argentina, Germany, Australia, Austria, Bahamas, Brazil, Canada, Chile, Denmark, Spain, the United States, Finland, France, Greece, Hungary, Ireland, Iceland, Italy, Japan, Mexico, Monaco, Norway, New Zealand, Holland, Paraguay, Poland, Portugal, United Kingdom, China, Switzerland, Sweden, Turkey, Uruguay, and Venezuela. Citizens of other countries need a visa to enter. Tourists who wish to drive can use a valid driver’s license from their own country for a period of up to three months. After that, foreigners should obtain a Honduran driver’s license. As of January 2007, all U.S. citizens leaving the United States need to have a current passport, regardless of destination.